In this week's issue of the journal PLOS ONE, the scientists report that a microsporidian called Nosema ceranae, which has been known to infect adult Asiatic and European honey bees, can also infect honeybee larvae. They also discovered that honey bee larvae infected with the microsporidian have reduced lifespans as adults. Since 2006, beekeepers in North America and Europe have lost about one-third of their managed bee colonies each year due to "colony collapse disorder." While the exact cause is unknown, scientists have speculated that pesticides, pathogens, mites and certain beekeeping practices have all contributed to this decline. Nosema ceranae, a kind of fungal pathogen spread by spores, is also implicated in colony collapse because it reduces colony health and is widespread. "Previous research suggested that Nosema ceranae could not infect honey bee larvae," said James Nieh, a professor of biology at UC San Diego who headed the research effort with graduate student Daren Eiri, the first author of the study. "But this was largely based upon indirect evidence: spore counts in newly emerged adult bees, which typically have low spore counts." Because Eiri and his co-authors conducted their experiments with larvae exposed to spores and reared in the laboratory, they said the extent of larval infection needs to be studied further using field bee colonies to determine the true impact of larval infection on colony health. Nieh noted that a study conducted recently by other scientists detected low levels of Nosema DNA in honey bee larvae, suggesting that larval infection can occur in field colonies. "However, no study had directly investigated whether larvae could become infected with Nosema ceranae," said Eiri. "Our study provides a direction to continue investigating this question outside the lab and in the field using entire colonies. The UC San Diego discovery may also clarify a mystery. 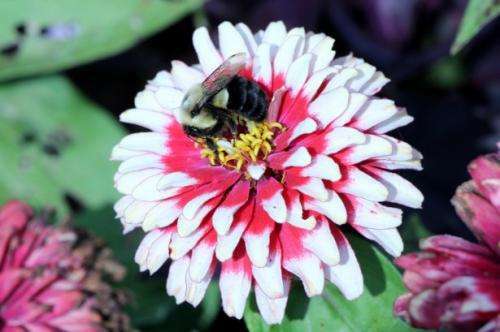 "One puzzling aspect of Nosema ceranae infection is that infection in adult bees usually decreases after medication is given by beekeepers to a colony, but can later resurge," Nieh said. "Some of this resurgent infection could be due to transmission between bee colonies or to adult bees that have a low, but resistant level of infection." "However, our study raises the possibility that brood are also infected. If so, this typically would not be detected for weeks until the emergence of adult bees. Generally, older adult bees are more heavily infected with Nosema. Thus, bees infected as brood may not develop high Nosema spore counts until they are much older adults, further delaying detection." Those unanswered questions suggest the impact of this microspordian on honey bee colonies deserves a second look. "We hope that our study will spur further research into how Nosema ceranae is transmitted and into the potential infection of larvae in natural and managed honey bee colonies in the field," said Nieh.